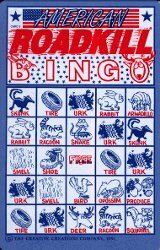 Roadkill Bingo has got to be the sickest bingo game yet! The Bingo Hideout team were trawling the internet for stories about bingo when we discovered Roadkill Bingo on Wikipedia, and we think it has to be the sickest bingo game to date. Why were we searching? Well when bingo news is scant – as is often the way with bingo – our writers will often search the internet or newspapers and magazines scouring for news stories to keep our readers entertained until the next major bingo news story breaks. Tummy turning ‘entertainment’ for long journeys? Usually of course we come across a new software product or bingo promotion, sometimes a story of a big bingo winner and sadly sometimes a tale of a crime committed in connection with bingo hall or player. Rarely however do we come across something so awful that it makes our tummies turn, as is the case with Roadkill Bingo. According to Wikipedia the game is usually played in cars on long journeys in America. Players will pre-prepare their Roadkill Bingo cards prior to travel, placing 24 images of different animals randomly each card. Then for entertainment the players in the car will mark off each roadkill that they see first (the driver will have a passenger mark his card for him for safety reasons). The first bingo player to mark off five dead animals in a row on their bingo cards must shout ‘bingo!’ to win the game. Prizes for winning the bingo game will be determined before the start of the journey by all passengers. Buy a T-shirt with Roadkill Bingo on it! So dear readers are we a little too squeamish in the Bingo Hideout office because we just think this game is wrong? What do you all think – fair game or sick entertainment? For those that like their bingo games a little less gory they can visit our bingo sites directory to find the best places and bingo games to play – no dead animals required!